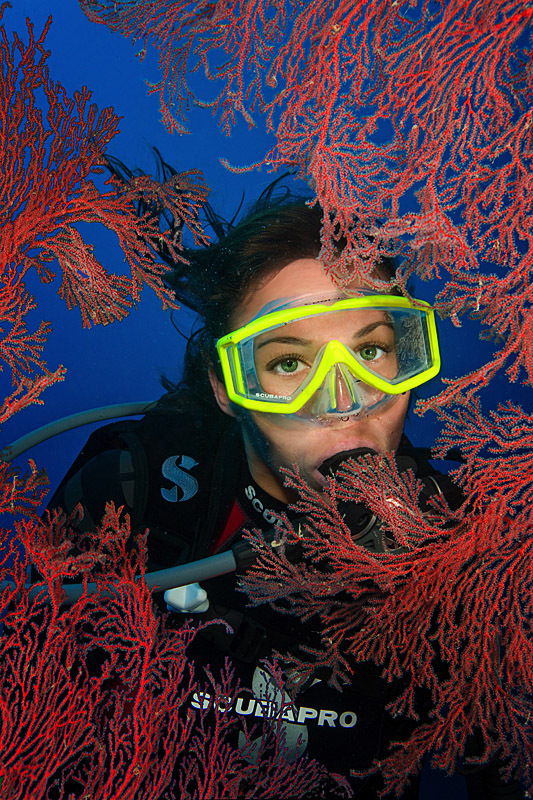 Scuba diver, underwater model, photo assistant and photographer Christina Macfarlane poses behind gorgonian fan on the Deep Wall divesite offshore Palau, Micronesia. So, you ask, "can she really be all those things?" Check http://christinamacfarlane.com and judge for yourself. Also, if you're an eco-diver, you may ask "can she can pose like that without harming the fan?" The answer is: "Absolutely. Yes. She has the training, experience, impeccable neutral buoyancy control, grace and a practiced one-finger hold-off to do it right." Before you ask, so does the photographer.